There are certainties in life we all experience: death, taxes, and shopping for food. One of these doesn’t have to be painful. In the decades that I’ve been the family food provider, I’ve learned a few things that have eased the burden of the experience and actually made food shopping fun. Well, maybe not fun like a Caribbean Cruise, but perhaps saving enough money to afford one! Shop around. You may be limited where you live, but there are several stores close to our house. (FYI, the places we shop from highest dollar amount spent to least in 2016 are: Costco, King Soopers (Kroger family of stores), Walmart, Sprouts, and Albertsons.) I’ve determined which stores usually have the best prices in various item categories. Like me, you may have a different place for meat, produce, dairy and the like. Create your weekly menu based on what each store has on sale. Often the front page of a store’s ad will highlight the best values and that will determine what will be on our table that week. I will also stock up on favorite items when the price is right. If I know I can buy chicken for $1.99 a pound, I’m going to wait for that price to buy it. My freezer is my friend. Combine shopping trips with other errands. It’s not worth the gas or time to drive across town to save a dollar. Likewise, it’s not most efficient to go out simply to buy food. So I try to bundle my errands so I can be the most efficient with my time and miles. We often stop at Costco after a movie since the store is on our way home from the theater. Sprouts is near where my daughter works, so I drop her off and do grocery shopping afterwards. Walmart is near many other stores so I go there when I have multiple stops to make in one general location. Learn prices. If you don’t know what a good value is, you’ll never get the best price. For example, on some items, not even the grocery store’s sale prices can match the value at Costco. But at other times a sale (plus even a coupon) can beat buying in bulk from Costco. And regarding bulk purchases, if you can’t actually use all the product before it expires, you’ve just lost your savings. Get the ads, apps, and loyalty cards from your selected stores. This is a huge step. I used to get the Sunday paper just for the coupons and it would take me over an hour to clip, sort, etc. Now, I just select the coupons on my store app and they load onto my card. Thank you technology! Many times you can stack multiple discounts — like a sale price on top of a coupon — which is quite common. Sometimes you even find an extra discount on top of this with a store-wide coupon (save $10 on a $50 purchase) to hit the trifecta. Take full advantage of each store’s loyalty program. In addition to the sales prices and coupons, King Soopers’ loyalty program offers a 10 cents off per gallon of gas for every $100 spent at the store each month (at their gas station, which is reasonably priced even without the discount). We have some months where we get 30 cents off a full tank of gas! In addition, the store gives away one free item every week through their app. We’ve received everything from a box of organic mac and cheese, to a bag of candy, to a can of cat food (we don’t have cats, but we get it anyway for our neighbors). Finally, they send us free and high-value offers now and then by email and mailed coupons for being “loyal customers”. They know us enough that the offers are on things we actually like — which is awesome! Make a list. Using the app and ads as a guide, determine what you will be buying and try to stick to the list. If I think ahead, I will even arrange my list into categories (produce, meat, dairy) to save steps and time. In addition, if you make your list comprehensive enough, it will limit the number of trips you make to shop which alone will save you a ton of money. Try the store brand. Often, they are the exact same product as the national brand and stores will usually refund or exchange these items if you don’t like them. They can often be cheaper than a name brand with a coupon. Check the unit prices. Certain stores will actually post the cost per unit on the shelf. We tend to think that the bigger container will be the best value, but that’s not always the case. Take advantage of special offers. Many stores will offer special promotions just for their store. I mentioned the save $10 off $50 in purchases which is a common Albertson’s promotion. King Soopers will offer deals on gift cards, especially around the holidays. For instance, we bought $40 of iTunes gift cards to give away as Christmas presents and received $5 off our grocery purchase that day. We did the same with Nike gift cards too. Costco even has coupons (they call them “instant rebates”) that makes their low prices even lower. Shop the clearance areas. King Soopers has clearance areas for meat, bakery items, and dairy products. Sometimes I can find better deals at other stores than even their clearance prices (this is where it pays off to know your prices), but oftentimes it’s a great deal, especially on the baked and dairy products. Pay attention when checking out. At the register, watch the prices and check the receipt. I have found errors on specials or mis-marked items. In addition, many stores will list the percentage saved on the receipt which can be quite rewarding. Watch the register for coupons. King Soopers has coupons that print out at the register as you make your purchases. About 2/3 of the time they are worthless (not great deals), but sometimes they are for free or drastically reduced products — a complete windfall. Many shoppers don’t even look for these coupons and leave theirs behind. Quite often I’ve come up to a self-service register to find previous customers have left a treasure trove of awesome coupons behind — just for me! Walk to the store. I know this is not for everyone, but one store is close enough that we can get there in a 15-minute walk. We’ll often walk down, buy what we need (knowing we have to carry it back is a great incentive to focus on limited items at the best prices), and walk back. In a bit more than 30 minutes we’ve improved our health, had the chance to visit, gotten a shopping task off the list, and saved some money! Over the years these methods have saved us thousands of dollars. These days our food costs are near the lower end of the national scale even with four adults in the house. As another point of reference, we have a receipt from King Soopers near the end of 2016. The bottom says that we had saved $1,209.65 up to that point through 2016. Quicken shows our total spending there during that time to have been $2,488.99. That means the retail prices for those items were $3,698.64 and we saved 32.7% off those prices. And this does not count the gas savings we received through the year. Not bad at all. 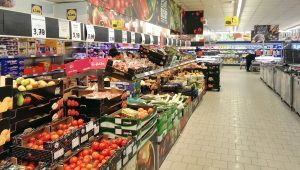 I hope these tips will help you save a bundle on your food costs. Are there any great ideas I may have forgotten? Great tips, Mrs. ESI! I am still working to make sure I use coupons on what I actually NEED (not buy items just because there are coupons available)… but I like your suggestion to build a week’s meal plan based on the current sales. Aside from the digital coupons your store may have, use other sites like SavingStar, Ibotta and MobiSave to get more cash back via Paypal for items on your list. That way you could possible quadruple your savings: 1) digital store coupon 2) physical manuf. coupon 3) store coupon and 4) SavingStar. Add in the cash back credit card and you save 5 ways! I love the yellow clearance tags at Wal-Mart. You can get bread, meat, and a few other categories for up to 50% off when something is close to the sell-by date. Do you have Aldi in your area? They usually have prices even lower than Wal-Mart, especially for produce. We also shop at a produce stand nearby that has prices that are lower than any of these stores. The products are delivered straight from the farm so we know it’s fresh. Finally, we grow peppers, eggplant and tomatoes in the backyard. That’s the best deal of all. Great article! I use Ibotta where I can, but overall implementing these strategies across the board are great to reduce food costs. Managing food costs, especially as your family grows, can be difficult – but not impossible. Nice write up, ESI! I shared this with my wife because we are always looking for ways to cut down our food budget each month. It started by drastically reducing the number of times we go out to eat. 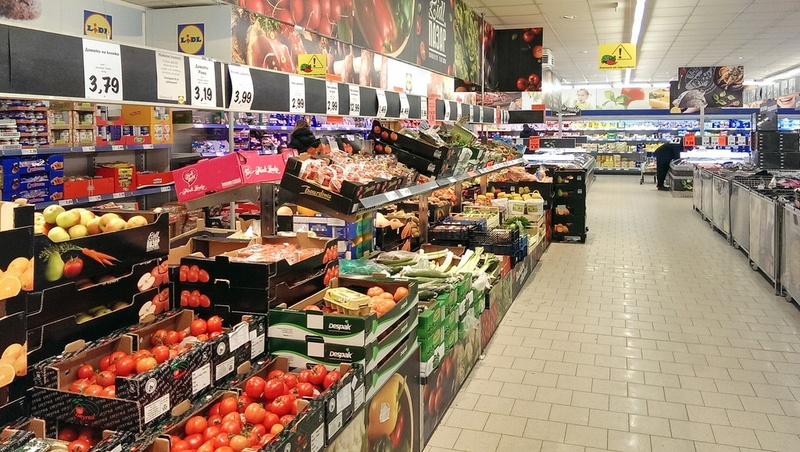 Now, we are tackling the grocery bill and this article should help us find more efficiencies! Fantastic tips, Mrs. ESI! I’ve done them all! Several years ago, I started a price book to learn what the best prices on our commonly purchased grocery items were. Now, the price book isn’t needed – it’s in my head. A list is my saving grace at the grocery store – otherwise I buy what I don’t need and forget what I do need (plus I save money by making the list at home with the store flyer in front of me). I arrange my list by store layout to save time too. My typical stop at the grocery store is about 15 minutes. Great tips! I love Ibotta an Shopkick but have been slacking lately because I am usually shopping at Aldi. I never got into couponing but it is fascinating to see how much people can save!! For those who think you can’t fed a family on a low grocery budget, you just need to get creative. There are so many great loopholes to discounted food!! Oh, and one tip to add, Go Curry Cracker mentioned hitting the farmers markets 20 minutes before closing time when the vendors will usually give a discount, sometimes half off! Great advice Mrs ESI. I may not be as diligent as you but I do implement most of these, just not 100%. I shop at Krogers, Costco, Tom Thumb, and Sprouts. All are on my way home or near the gym, so I do incorporate my trips very easily. Food or really Grocery (includes household items, tide, soap, trashbags, etc) is my #3 spend behind rent and activity/entertainment (which includes my vacation). So it is one expense that I do key on that is rather easy to save on. I saw others talk about other apps so I need to check those out. Great to read real life examples and find new ways to save. I also agree in buying in bulk items that dont expire or you can freeze can save quite a bit. Big sale items will typically go on sale quarterly or bi-monthly so watch out for those and buy several. One example was antipersperant …sale at .99 regularly 2.19. Had a coupon too, which lowered the price. Bought 15. I am good to go for awhile, smelling fresh :). Thanks for sharing. For me, one of the big ones that goes to the list is “Do not go grocery shopping on an empty stomach!” I end up buying wayyyy too much food. And somehow more junk food ends up in the cart as well. Way more control if you’re already full from a recent meal! Glad I read the comments to the end. That was my main tip. Eat then shop. In the UK we now have to pay if we want a plastic bag to carry the shopping home. If you don’t take any bags with you and you are tight with money (that means careful/mean with your money, not sure you use the phrase ‘tight’ in the USA) then you can only buy what you can carry in your bare hands if you’ve walked there and won’t pay the 5p or 10p for a bag. All good ideas. I do not even bother checking what store has the best deals anymore. I just go to Aldi’s now. My food spending has been cut in half by just shopping there. Dozen eggs? 99 cents. I kept talking about how much I was saving 4 of my co-workers tried it and now they are hooked too. One just has to get used to less choices, different brand names but food quality is very good. Oh bring a quarter for the cart and your own bags. These are good tips. However, you missed out on grow your own. I grow harvest, and preserve most of our food. Having a husband who loves to fish also saves lots of money. Coupons and sales are all great but growing your own food p as much as possible is healthy and very inexpensive. Not to mention good exercise! Homegrown fruits and veggies just plain taste better and they never suffer from recalls! I don’t think much of those amounts printed on the receipts that I allegedly “saved.” I consider the price they discount from to be artificially high. Therefore, I believe the price with the store’s card are the actual prices in most cases. That said, I found it affirming that I am already using all these strategies. Thanks! Look into Aldi. Really low prices. The store is mostly private label products, but I have found them to be comparable to name brand products. They will refund your money if you are not satisfied. Aldi has fewer SKU’s available, but that is part of why they have lower prices. Thanks for sharing your idea. One additional tip that seved us a fortune over the year is shopping only one day. Thank you for providing this comprehensive list. You have provided us readers with some solid suggestions. We have gotten good with knowing prices. We never buy chicken breasts for more than $1.99 per pound or bread for more than $2 per loaf. Store brands are always great deals. The quality is the same as leading brands. I just cannot buy store brand peanut butter or ketchup. We also try to compare flyers to find what store has the best prices on what we need. I will second watching the till when you are checking out. In Canada, if the price that comes up when they scan doesn’t match the price listed on the shelf you can get the item for free if it is less than $10 (not sure on the exact number could be 15). I have gotten a few items for free this way. Most stores will give you a discount if it is over the threshold. Food costs are always a really high line item for us! I think shopping with a list is one of the best tips. And avoiding “extra” trips to the store to buy one or two more items, but walking out with 10 more things! We live so far away from a grocery store (20 minutes) that I go once a week, but if I’m in town, I will check out their sale items. I wish we had an Aldi’s, because when we lived in Atlanta, we shopped there and saved a ton! Thanks for sharing your tips! Sorry, but I don’t see the “joy” in going to Walmart for milk, Costco for meat, and Food Lion for canned goods (or whatever). Now maybe some might find this shopping better than having be at work, but I would rather work an extra year or 2 and have a less stressful grocery shopping experience. I’m glad it works for you and others though, juts not appealing to me at all. By no means would I buy high end stuff like caviar without shopping around, but routine groceries? not for me. We live in the same ‘hood and probably shop the same stores. We also use Amazon enough to buy Amazon gift cards at King Soopers with the 4X point promo, getting 2% back on the Visa and money off on the gas–$100 Amazon card can save 40 cents per gallon on gas. When we have that much off we take two empty cars to the station–one on each side of the pump–and fill them both. Also, Walmart’s app lets you scan your receipt after the purchase and it looks for additional price-match savings; these often aren’t huge but results in several percent off a total purchase. god forbid people eat less? have some leftover and you can get one more meal and dollar cost average that food. measuring really helps. and you might lose weight. Most of the foods we eat don’t have coupons. Store brands are usually cheaper anyway. No coupons for produce. We shop at a Farmer’s Market for eggs and other produce and meat. My wife hates most processed foods.